Does Decorative Concrete Need A Sealer? Home → Concrete Knowledge → Does Decorative Concrete Need A Sealer? The simple answer is yes. Of course, there are no real simple answers when it comes to decorative concrete. When talking about stained concrete floors, the bottom line is the decorative concrete installation isn’t truly complete without the application of a quality sealer. Taking the time to put down a layer (Usually one or more coats) of protection not only prolongs the life of our beautiful handiwork, but it is also designed to enhance and preserve the stained concrete appearance. 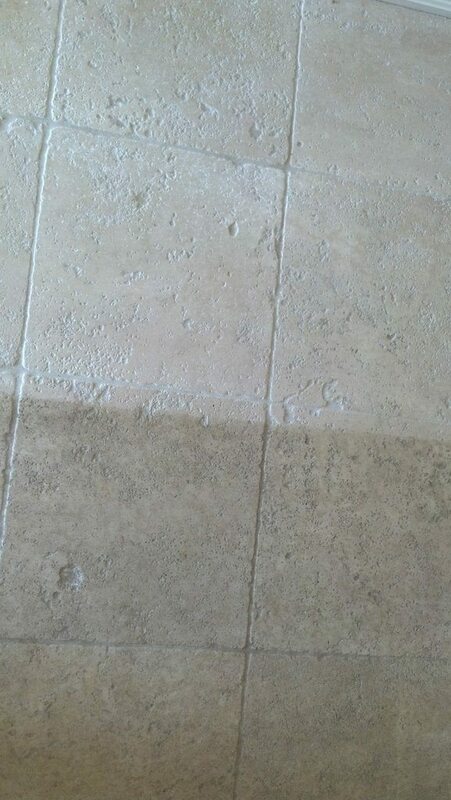 Concrete sealer will enrich the color intensity of the concrete (Both interior and exterior). The color of the decorative concrete, whether it’s stained concrete, stamped concrete, a concrete overlay or polished concrete will become beautiful! Sealing a stained concrete floor adds a sheen to the surface that ranges from a satin seal to a high gloss seal. It blocks the penetration of dirt, oil, grease, chemicals, and other stains, making the stained concrete and sealed concrete easier to clean and maintain. Sealing stained concrete, stamped concrete and polished concrete will also protect against abrasion and wear. Here’s the deal, though. To get each of these great perks, the right sealer for the job must be used. When searching the internet, you’ll literally find hundreds of products on the market that can suit just about every type of concrete sealing application you can think of, but there is no such thing as one sealer being perfect for all stained concrete, polished concrete or stamped concrete flooring projects. Making things worse, if you end up using the wrong sealer for your stained concrete floors, stamped concrete or polished concrete or even apply it improperly, it can ruin an otherwise flawless stained concrete, stamped concrete or polished concrete flooring installation. To help you sort through the endless options of stained concrete floor sealers, and hopefully avoid making mistakes you’ll regret later, please don’t hesitate to contact us at any time. We have the knowledge and ability to make sure the right concrete sealer is being used for the right stained concrete, stamped concrete or polished concrete floor. Don’t hesitate to ask a Glossy Floors representative about the use of sealer and its many advantages on your stained concrete, stamped concrete or polished concrete floors. If you plan on having another concrete contractor install a sealer on your stained concrete, stamped concrete or polished concrete floor, ask lots of questions and never settle for what we like to call “hidden answers”… Answers that go around a direct question. If you’re left confused, ask again. If you’re looking to put a sealer on top of an epoxy floor, make sure you do the research before your installation. We’re planning on several articles about the use of sealers, so check back often to see if we have the articles on sealer that pertain to your particular concrete project. Putting a sealer on an epoxy floor is completely different than putting a sealer on stained concrete, stamped concrete or polished concrete. Give us a call today and let us help you turn your existing concrete into a work of art! To see some examples of our stained concrete, please visit our stained concrete image gallery. As always, please feel free to contact us about any of your decorative concrete staining questions or to plan your next concrete staining project with Glossy Floors. Glossy Floors is the premier concrete contractor for Northwest Arkansas, Tulsa, Oklahoma and Missouri and we want to be your concrete company. We would like to be your concrete staining company from Northwest Arkansas, Tulsa, Oklahoma and Missouri. We’ve been proudly serving customers from [mygeo_city], [mygeo_region] to Houston, Texas since 1987! For your added convenience, we offer an online bid request form. Fill out a simple form for the day and time most convenient to you and we’ll show up and give a free, written estimate. It’s as simple as that! We also have a low price guarantee: Show us a written bid from another concrete company in Northwest Arkansas, Tulsa, Oklahoma or Missouri and we’ll match it!